A dust mask is recommended for sanding because they’re not expensive and why breathe in all of this sand and chemicals? Gloves are also recommended just to avoid any hassle. 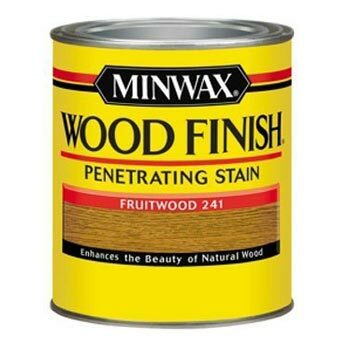 If the furniture already has a coating of paint/polyurethane on it, it’s recommended to use wood stripper to remove it. Sanding down the protective coating is a waste of time and sandpaper. When using wood stripper, use an ample amount of it to save time. Start with more coarse grain (i.e 100-150 grain) and work up to smoother grain (i.e. 200 grain). You don’t want sandpaper that’s overly coarse (don’t go under 100) and you don’t want to use anything that might scratch the wood like steel wool. How smooth you do depends on how you want to finish the wood. If you simply want to stain the wood (or apply a very light coating of polyurethane), you may want to go finer because the texture of the surface will be the same as the texture of the wood. However, if you are glazing the wood, getting the wood super-smooth doesn’t matter because it will have a protective coating anyway. To remove the sawdust, a brush or a broom is recommended. Staining is only for color – not for texture and protection. However, stores do sell stain and polyurethane combined. Make sure you shake the wood stain to make it even before applying. Applying it with a brush is fine; as long as you apply enough and smooth it out, there won’t be stroke marks. One container of wood stain goes a long way because there is an intense amount of coloring in it. However, you do want to apply a liberal amount of it (two coats) to make sure all of the wood absorbs it. Otherwise, some parts are going to be more colored than others. Wood stain typically takes 12 hours to dry. Polyurethane typically takes 24 hours to dry. Glaze typically takes 30-60 minutes to dry.